Enjoy a private Japanese tea ceremony with a maiko, an apprentice geisha, in Osaka for an immersion into Japanese culture. The ceremonial tea ritual is believed to promote a state of general well-being and mindfulness, and involves the preparation and drinking of matcha, a powdered green tea that is loved in Japan. 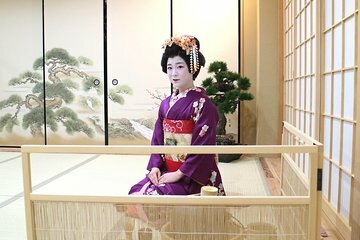 From your maiko, you'll learn about the history of tea in Japan as you sip, and hear tales of the samurai and priests who spread its popularity. This was one of the highlights of our trip. We all dressed in authentic kimonos and participated in a tea ceremony with a Geisha. It was very entertaining and we were able to ask many questions about the life of a Geisha.